Wednesday 10 June - Guest Speaker: Far North Deputy Mayor Tania McInnes - Our Voices, Our Vision. On Wednesday June 10, Far North Deputy Mayor Tania McInnes will speak to the club about Our Voices, Our Vision in which the council is asking residents what they want the Far North to look like in 2050. Please note that Tania will speak at 6pm and dinner will be served at 6.30pm. To find out more about Our Voices, Our Vision go to the website and/or the Facebook page. Link to Rotary Weekly - 5 June 2015. 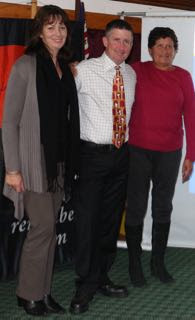 Tony Scott and partner Heather Stanley were special guests of Kaikohe Rotary last week. Tony lives in Pakaraka but is a firefighter at Auckland International Airport. In 2003 he initiated the Sky Tower Challenge. In the first year nine firefighters raced the 1103 steps up the Sky Tower, raising $17,500 for Leukaemia and Blood cancer. This year 750 firefighters - including some from Australia, USA, Germany and Chile - took part, raising more than $1 million. The growth in the event is due to Tony and Heather's hard work and enthusiasm which has led to brigades from the length of the country reaching out to their communities. Kaikohe's Brigade received a Community Award for raising more than $18,000 despite our town's small population. Thank you Tony for a really interesting presentation. It was a privilege having you and Heather with us. They are pictured with Kaikohe Rotary President Liz Henley.